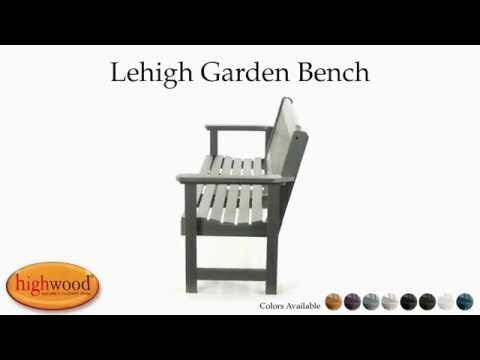 This Porch Swing is extremely popular from coast to coast and is part of the Lehigh Collection. It comes in 4ft and 5ft widths and is supplied with a rust-resistant chain so it is ready to hang to a sturdy structure. Please use strong hooks -not provided - to hang the chain from and support the weight of the loaded swing. Extra lengths of chain are available on request for a small fee if required. This product has been load tested, per ASTM 1561-03 (2008) standard for Outdoor plastic furniture, and has a 500-pound weight capacity. Some assembly is required (see assembly guide). I purchased the 4 foot Leigh Porch Swing in Charleston Green and I love it. Not a gathering goes by where I don’t get a compliment on it. If you are looking for a porch swing, I recommend this one. This swing replaced a wooden swing which broke. We love the fact that there is no maintenance on the Highwood products and look forward to many years of enjoying it. It is very comfortable and well made. Will never have a outdoor wooden product again! This swing was a gift from our 3 children and 7 grandchildren. It's beautiful and well made. Purchased this swing thinking it would be low maintenance. The back of the swing has spaces/pockets next to the slats that will hold water/pollen/etc. Asked if it was possible for the back to be replaced and was told I would have to pay shipping for both the new and the old one to be returned. Not very helpful. Would not recommend this swing!! We bought this swing for our parents' front porch. They spend hours out there with the grandkids. It's become the centerpiece of their home.